A simple extension that adds a new toolbar containing a button to open Fiddler, along with a corresponding Tools menu option. When you only rarely need to launch Fiddler you may wish to disable the toolbar, to avoid cluttering up the IDE. When you need to launch Fiddler on an ad-hoc basis you may wish to use the Tools menu option, rather than enable and subsequently disable the toolbar. When you need to repeatedly launch Fiddler to solve a problem you may wish to enable the toolbar, allowing instant access to launch Fiddler , and once the problem is solved disable the toolbar, to avoid cluttering up the IDE. Or, of course, you may wish to keep the toolbar permanently enabled. 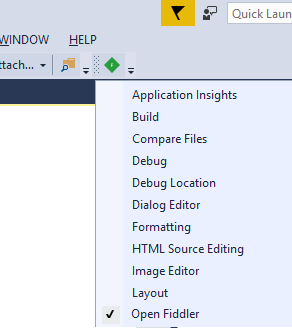 This extension is similar to Visual Studio's External Tools functionality. External Tools is more feature-rich (e.g allows specification of arguments) but does not associate an icon and creates a tools menu option only, not a toolbar as well.